Congratulations to Scott Chambers, Tim Droubay, Chongmin Wang and Kevin Rosso on having their article highlighted on the cover of the November 2006 issue of Materials Today. Published by Elsevier, more than 14,000 scientists in industry, academia and government agencies receive this authoritative, peer-reviewed journal. In this article, the researchers seek to answer the question: "Is it possible to create magnetic semiconductors that work at room temperature?" This is one of the 125 critical unanswered questions recently posed in Science Magazine. The researchers sought to answer this question by exploring the relationship between donor electrons and the alignment of the magnetic spins in oxide semiconductors. The team discussed their work on two well-characterized materials: cobalt-doped zinc oxide and titanium-doped ferric oxide. Both materials were grown as crystalline films in the Environmental Molecular Sciences Laboratory. In the first material, some of the zinc atoms were replaced with cobalt, i.e., the host, zinc oxide, was doped with cobalt. 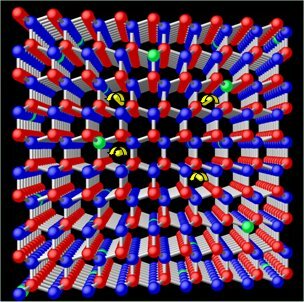 In the second, titanium atoms replaced some of the iron atoms in ferric oxide. The team saw tantalizing, but very different results for both oxides. Significant work remains before this material could be used to create a new generation of computer chips. These new chips may be faster and use less power, and may lead to new functionality that would endow future computers with the ability to carry out complex calculations that are beyond the scope of current computers. Crystal diagram of cobalt-doped zinc oxide showing the location of the atoms and the movement of spin polarized electrons (yellow). Green balls are cobalt. Blue, zinc. Red, oxygen. [Full Image]. Citation: Chambers, SA, TC Droubay, CM Wang, KM Rosso, SM Heald, DA Schwartz, KR Kittilstved, and DR Gamelin. 2006. "Ferromagnetism in oxide semiconductors" Materials Today, 9(11): 28-35.